Kitchens are the spaces where we cook or prepare food. It fills the entire house with the aroma of delicious food and makes every one feel hunger. Kitchen room is designed as open kitchen or it is enclosed with a door. The room has cabinets, counters, faucet, island, chairs, dish wash liquids or soaps, chimney, micro wave oven and ceramic glasses, jars, plates. The interior can be designed in many ways based upon the space of the kitchen room. It can be L shaped, I shaped with island and U shaped. Few people place dining table in the kitchen so that it will be easy to cook and serve food and they may even use island as dining. 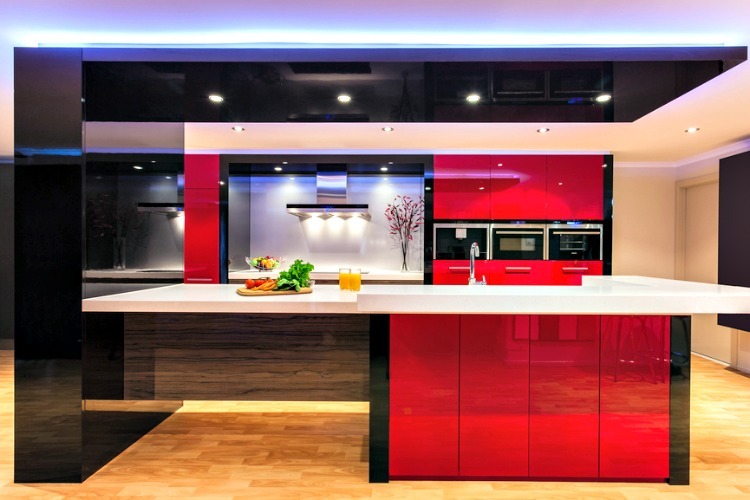 Kitchen can be designed according to your taste because some like to have a open kitchen with empty space. You can even place electrical appliances such as grinder, induction stove, electronic cooker, oven, toaster, refrigerator and mixie as it will be easy to prepare the food quickly if all are placed in the kitchen room. 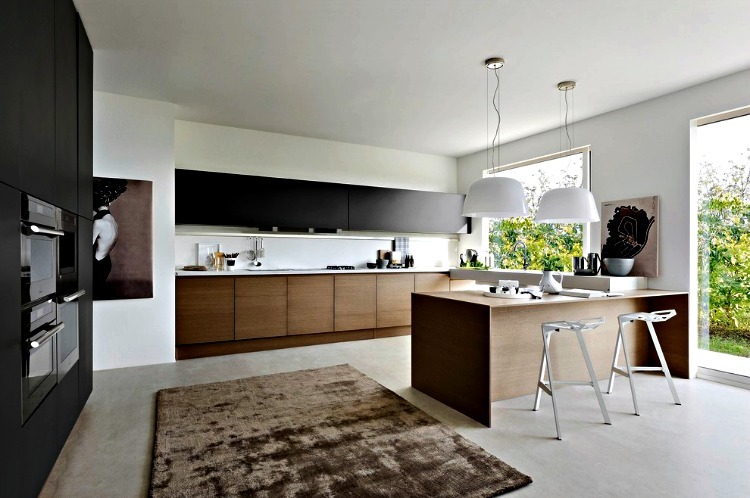 Here are modern designs of kitchen room which will be useful to design your interior look modish. The design of the interior also has an effect on cooking. Make your interior look good so that you feel pleasant when you cook. 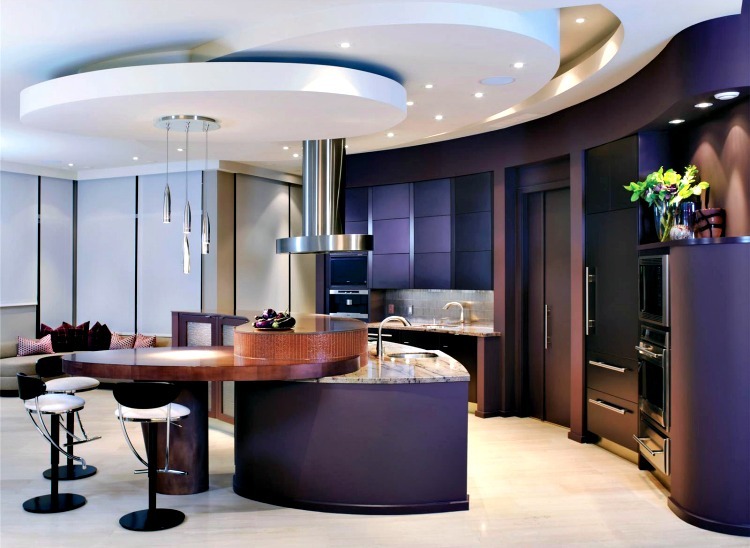 The kitchen room looks amazing with the dark purple cabinets which is alluring the entire room. The false ceiling is pop ceiling obtained from gypsum when water is removed from it and is moulded in oval shape with the ceiling lights and metal pendant lights. The flooring is made of white wood which is shining by the reflection of lights. The kitchen has purple cabinets to store groceries and has separate cabinets to place the micro wave oven. The interior is decorated with wall cladding and the kitchen has an island to prepare food and cut vegetables. It also has faucet, sink and chairs for seating. This is a open kitchen where you can see modern couches with bright cushions are placed on either side of the room. If you are looking for a modern open kitchen this design is apt and is classy. In the view of this image you can see a modern kitchen interior. The flooring is made of plain vinyl flooring and the false ceiling is dry wall ceiling with a rectangular chandelier. The kitchen is I shaped with an island and chairs adjacent to it for having casual drinks. The cabinets are placed on the right side of the wall to store groceries and all the kitchen ware. The interior is decorated with the wall cladding and picture windows to view the outstanding outdoor which makes you refresh. The flooring has a thick patterned throw rug. The kitchen design looks modern with the plain dry wall ceiling. The kitchen is L shaped kitchen with ceramic plates, stove, faucet, sink and glass pottery. The flooring is made with plain vinyl flooring which has a plush carpet on it. There are brown cabinets to store kitchen ware and it also has micro wave oven placed in the wall cladding. There is even a modern dining orbed table with the chairs for consuming food. The kitchen has lofts to store the dishes which is directly attached to the roof. The kitchen has dry wall ceiling with two metal pendant lights. The kitchen is I shaped kitchen and has brown island with two stools for preparing food. The interior has casement windows to view the exterior garden. The kitchen has stove, faucet, counters and cabinet for placing the kitchen ware. On the either side of the kitchen wall is decorated with the wardrobes and micro wave oven is placed in it. The interior is decorated with snowy white walls with a painting and a wall art. The flooring is made of plain vinyl flooring with a brown throw rug which is sprucing the entire room. 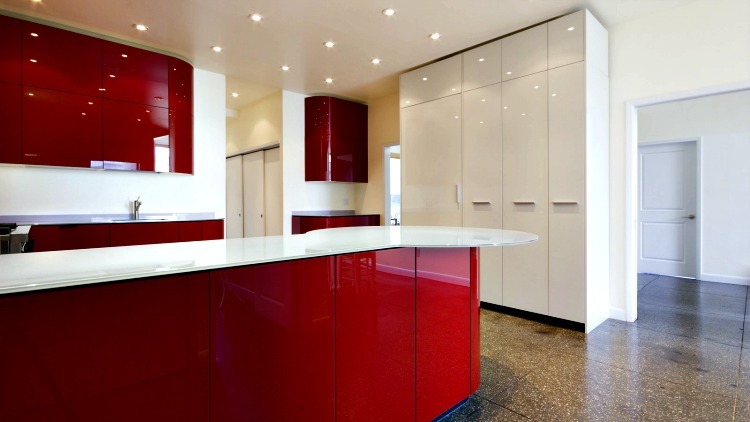 The kitchen room looks gorgeous with scarlet red cabinets. The false ceiling is plain and dry wall ceiling and a pendant light is attached to the roof. The micro wave oven is inbuilt inside the cabinets. The counter in the kitchen has stove, mixie, faucet and sink. A chair is placed for seating and can prepare the food. There are glass cabinets in which glass bowls, ceramic plates are placed and the closet has ceramic bowls and tins. The flooring is made of ceramic white tiles which looks glossy. 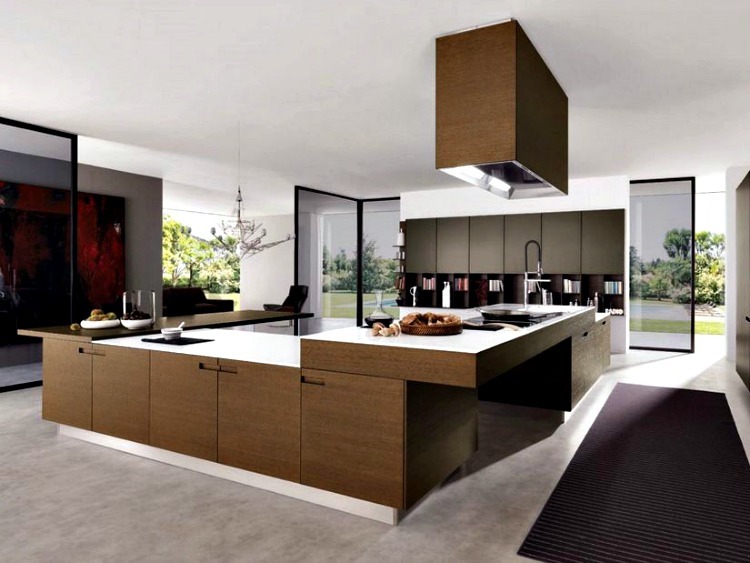 You can choose this modern design of kitchen if the kitchen space is more. The flooring is made with the marbles and has a thick rug on it. The ceiling is dry wall ceiling with wooden chimney attached to it. The kitchen has cabinets for placing all the kitchen ware and groceries in it. The counter is decorated with the ceramic bowls of edible items in it. The room has sliding picture windows to view the outer garden. The kitchen room false ceiling is dry wall ceiling with the light fixtures. The flooring is laid with textured tiles and the cabinets are glossy. There is a faucet and a sink in the kitchen and the groceries is stored in the cabinets. The micro wave oven is in built in the cabinets. This is I shaped kitchen and if you have a small space you can choose this type of interior which looks modern and impressive. The kitchen room looks fantastic with the hardwood flat cabinets. The flooring is made of polished concrete which gives a cozy appearance. The kitchen has casement windows to get fresh air and can view outdoor. The kitchen has navy blue cabinets and in built micro wave oven. The false ceiling is a dry wall ceiling and the room has even a dining table with the chairs and is decorated with the glass jars and flower pots on it. This modern kitchen room looks glossy with the gold accents. the flooring is made of high gloss plain vinyl flooring and has wooden closets placed with the legs. The ceiling is a dry wall ceiling with a pendant light attached to the roof. The counter in the kitchen has a stove, faucet and glass jars. The wooden cabinets are used for storing kitchenware and has a microwave oven inside it. The kitchen room has sheer draperies. The kitchen room is decorated with crimson red cabinets and the counters are served with the juice glasses, vegetables and fruits. It has a faucet, sink and stove. The room has a chimney which is an outlet and makes the room smoke and oil free. The cabinets are eye catching and has an inbuilt micro wave oven. The flooring is made of laminated hardwood and the false ceiling has black ply wood panelling with the light fixtures. This design can be chosen even if you have small space for kitchen.